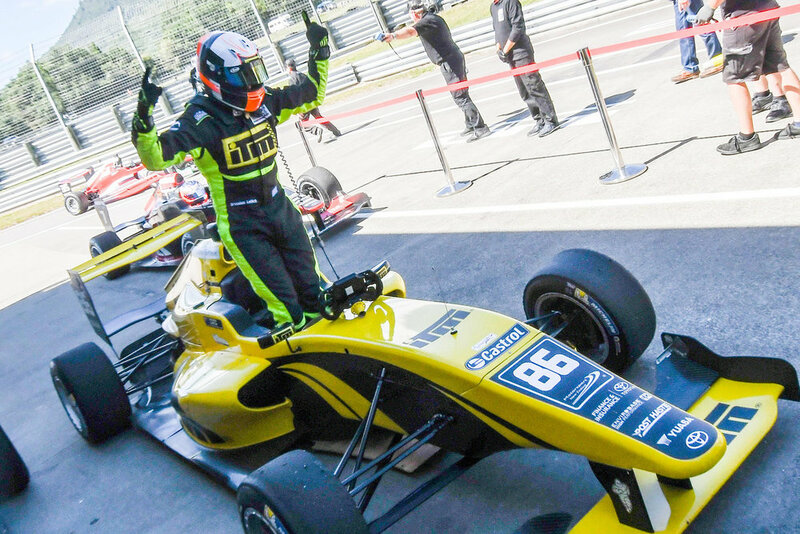 The Kiwi Driver Fund was established in 2015 to assist young New Zealand drivers to develop their careers, within New Zealand and overseas, ultimately representing our nation on the world racing stage. We recognise that New Zealand drivers often find it difficult to achieve and maintain the level of funding required to compete at the highest level. The Kiwi Driver Fund aims to assist these drivers. Our mission is to identify New Zealand’s potential world champions in motorsport and give them a boost along the way. The Kiwi Driver Fund gives a financial kickstart to qualifying young Kiwi drivers to compete in the Castrol Toyota Racing Series. The funds received cover part of the cost of competing in the Castrol Toyota Racing Series, which is New Zealand’s premier single-seater racing category, attracting drivers from around the globe. The Toyota Racing Series has helped many young New Zealanders on to the international stage. Four independent trustees govern the Kiwi Driver Fund. Applicants for the Kiwi Driver Fund submit a full resume and plan for their future career, as well as demonstrate strong communication skills. They are expected to have the bulk of their funding, and a team in place, so that the Kiwi Driver Fund supplements this. The Kiwi Driver Fund trustees review applications and make annual grants to talented, qualifying drivers. Motor racing legend Chris Amon started life on a farm in Bulls, Rangitīkei, before becoming a world-renowned driver in Europe in the 60s and 70s. Chris drove alongside Bruce McLaren in a Ford GT40 to win the 24-hour Le Mans race in France in 1966 and has a prolific Formula One history of 96 Grand Prix starts. He holds the record for the most different makes of car raced by a Formula 1 World Championship driver, with 13. In 1993, he was awarded an MBE for his services to motorsport, and was inducted into the New Zealand Sports Hall of Fame in 1995. The Chris Amon Trophy is awarded to the driver gaining the highest aggregate points overall from all five rounds constituting the Toyota Racing Series Championship, and Manawatū’s Manfeild Circuit Chris Amon is named in his honour. Chris Amon was the Kiwi Driver Fund founding patron, and passed away in 2016, at the age of 73. Ken Smith is a New Zealand motorsport legend with multiple non-F1 Grand Prix titles, including three in New Zealand and several overseas. He started his driving career in 1958, winning the New Zealand Hill Climb Championship at just 16. He has competed in Formula Ford, Formula 5000, Formula Pacific, Formula Mondial and the Toyota Racing Series. Kenny has won the Gold Star Driver’s Award numerous times and was awarded the MBE in the 1987 Queen’s Birthday Honours for services to motorsport. He was inducted into the New Zealand Motorsport Hall of Fame in 1995, awarded Motorsport Personality of the Year in 2008, and in 2010 he received a Motorsport New Zealand Special Award. Ken is our current patron.